I know I have already submitted an entry for Barbara’s Taste of Yellow event, honoring those who have battled cancer and remembering those who aren’t with us anymore. My salad dressing recipe I posted really is quite fabulous – thanks there, Tyler Florence. However, since it didn’t have FOOD in it, per se…it didn’t feel quite right. I really love this time of year, particularly for the sake of produce. The bounty of favas and tomatoes and squash – all bursting with color. 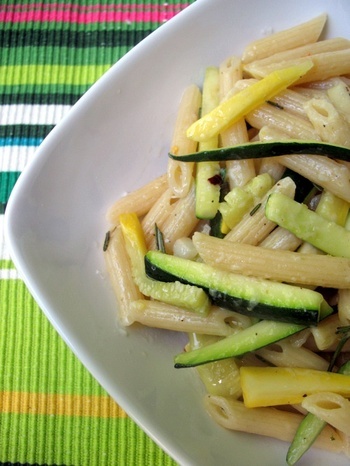 I came across the recipe and it had all sorts of things I like in it: squash, zucchini, garlic, and pasta. The addition of rosemary was pretty unusual – I tend to only use rosemary when I’m grilling or roasting. Truthfully, I think you could substitute it with basil and be equally as happy. In addition to changing up the type of pasta I used, I amped up the salt & pepper and added some red chili flakes and some lemon zest. The last minute sprinkle of cheese on top really brings the dish together – creamy and buttery with notes of fresh spring veggie taste. Fill a 6-quart pasta pot three fourths full with salted water and bring to a boil for pasta. Trim vegetables and cut into 1 1/2 x 1/4-inch sticks. In a deep 12-inch heavy skillet melt butter over moderate heat and cook vegetables with salt and pepper to taste, stirring gently, 2 minutes. Add rosemary and cook, stirring gently, until vegetables are just tender, about 2 minutes more. Remove skillet from heat. Cook pasta in boiling water, stirring occasionally, until al dente and ladle out and reserve 1 cup pasta water. Drain pasta in a colander and add to sauce with 1/4 cup reserved pasta water and salt and pepper to taste. Heat mixture over low heat, gently tossing (and adding more pasta water as needed if mixture becomes dry), until just heated through. Always nice to have a second entry from you Tami. Fabulous colours. It looks delicious. Have you ever used Curcuma? Probably can be also used for this plate.